Is there nowhere on the face of the Earth where opinion polls arent taken? In the wake of the 50-day Israeli assault on Gaza, parts of that tiny strip of land now look, according to photographs, like a moonscape of destruction. At least 10,000 homes were obliterated and thousands more damaged; at least 175 major factories were pummeled into the dust. Its only power plant was destroyed, damaging electricity, water, and sewage systems. Large apartment houses, as well as the ministry of education, schools, and other sites, were hit and sometimes reduced to so much rubble. It was all part of a massive Israeli assault on Hamas, several of whose senior leaders were assassinated, but also on the Palestinian population, involving what looked like collective punishment for its support of that organization or simply living in proximity to it. 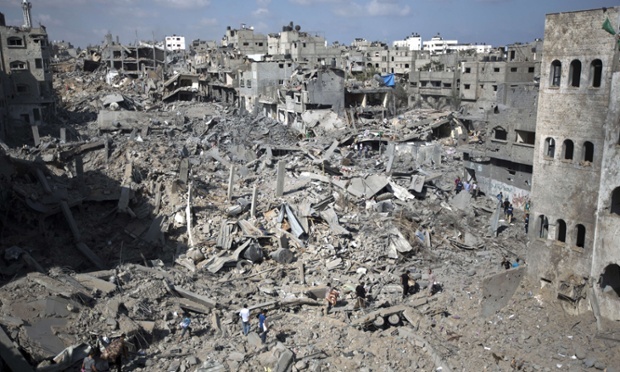 And indeed, with almost no hope of rebuilding much of their world any time soon, you might think that Palestinians would hold the Hamas leadership at least somewhat responsible for the destruction that has rained down, as assumedly the Israelis wanted them to. But a recent poll by the Palestinian Center for Policy and Survey Research (PSR), begun in the last day before the ceasefire took hold, and carried out, in part, amid the rubble that is now Gaza, suggests otherwise. The first of this series was the Agreement on Movement and Access Between Israel and the Palestinian Authority in November 2005. It called for a crossing between Gaza and Egypt at Rafah for the export of goods and the transit of people, continuous operation of crossings between Israel and Gaza for the import/export of goods, and the transit of people, reduction of obstacles to movement within the West Bank, bus and truck convoys between the West Bank and Gaza, the building of a seaport in Gaza, [and the] re-opening of the airport in Gaza that Israeli bombing had demolished. That agreement was reached shortly after Israel withdrew its settlers and military forces from Gaza. The motive for the disengagement was explained by Dov Weissglass, a confidant of then-Prime Minister Ariel Sharon, who was in charge of negotiating and implementing it. The significance of the disengagement plan is the freezing of the peace process, Weissglass informed the Israeli press. And when you freeze that process, you prevent the establishment of a Palestinian state, and you prevent a discussion on the refugees, the borders, and Jerusalem. Effectively, this whole package called the Palestinian state, with all that it entails, has been removed indefinitely from our agenda. And all this with authority and permission. All with a [U.S.] presidential blessing and the ratification of both houses of Congress. True enough. The disengagement is actually formaldehyde, Weissglass added. It supplies the amount of formaldehyde that is necessary so there will not be a political process with the Palestinians. Israeli hawks also recognized that instead of investing substantial resources in maintaining a few thousand settlers in illegal communities in devastated Gaza, it made more sense to transfer them to illegal subsidized communities in areas of the West Bank that Israel intended to keep. Israel soon had a pretext for violating the November Agreement more severely. In January 2006, the Palestinians committed a serious crime. They voted the wrong way in carefully monitored free elections, placing the parliament in the hands of Hamas. Israel and the United States immediately imposed harsh sanctions, telling the world very clearly what they mean by democracy promotion. Europe, to its shame, went along as well. The U.S. and Israel soon began planning a military coup to overthrow the unacceptable elected government, a familiar procedure. When Hamas pre-empted the coup in 2007, the siege of Gaza became far more severe, along with regular Israeli military attacks. Voting the wrong way in a free election was bad enough, but preempting a U.S.-planned military coup proved to be an unpardonable offense. A new ceasefire agreement was reached in June 2008. It again called for opening the border crossings to allow the transfer of all goods that were banned and restricted to go into Gaza. Israel formally agreed to this, but immediately announced that it would not abide by the agreement and open the borders until Hamas released Gilad Shalit, an Israeli soldier held by Hamas. Israel itself has a long history of kidnapping civilians in Lebanon and on the high seas and holding them for lengthy periods without credible charge, sometimes as hostages. Of course, imprisoning civilians on dubious charges, or none, is a regular practice in the territories Israel controls. But the standard western distinction between people and unpeople (in Orwells useful phrase) renders all this insignificant. Israel not only maintained the siege in violation of the June 2008 ceasefire agreement but did so with extreme rigor, even preventing the United Nations Relief and Works Agency, which cares for the huge number of official refugees in Gaza, from replenishing its stocks. On November 4th, while the media were focused on the U.S. presidential election, Israeli troops entered Gaza and killed half a dozen Hamas militants. That elicited a Hamas missile response and an exchange of fire. (All the deaths were Palestinian.) In late December, Hamas offered to renew the ceasefire. Israel considered the offer, but rejected it, preferring instead to launch Operation Cast Lead, a three-week incursion of the full power of the Israeli military into the Gaza strip, resulting in shocking atrocities well documented by international and Israeli human rights organizations. A new ceasefire agreement was indeed reached, but the terms, similar to the previous ones, were again never observed and broke down completely with the next major mowing-the-lawn episode in November 2012, Operation Pillar of Defense. What happened in the interim can be illustrated by the casualty figures from January 2012 to the launching of that operation: one Israeli was killed by fire from Gaza while 78 Palestinians were killed by Israeli fire. So matters continued until April 2014, when an important event took place. The two major Palestinian groupings, Gaza-based Hamas and the Fatah-dominated Palestinian Authority in the West Bank signed a unity agreement. Hamas made major concessions. The unity government contained none of its members or allies. In substantial measure, as Nathan Thrall observes, Hamas turned over governance of Gaza to the PA. Several thousand PA security forces were sent there and the PA placed its guards at borders and crossings, with no reciprocal positions for Hamas in the West Bank security apparatus. Finally, the unity government accepted the three conditions that Washington and the European Union had long demanded: non-violence, adherence to past agreements, and the recognition of Israel. Israel was infuriated. Its government declared at once that it would refuse to deal with the unity government and cancelled negotiations. Its fury mounted when the U.S., along with most of the world, signaled support for the unity government. There are good reasons why Israel opposes the unification of Palestinians. One is that the Hamas-Fatah conflict has provided a useful pretext for refusing to engage in serious negotiations. How can one negotiate with a divided entity? More significantly, for more than 20 years, Israel has been committed to separating Gaza from the West Bank in violation of the Oslo Accords it signed in 1993, which declare Gaza and the West Bank to be an inseparable territorial unity. Furthermore, Israel has been systematically taking over the Jordan Valley, driving out Palestinians, establishing settlements, sinking wells, and otherwise ensuring that the region  about one-third of the West Bank, with much of its arable land  will ultimately be integrated into Israel along with the other regions that country is taking over. Hence remaining Palestinian cantons will be completely imprisoned. Unification with Gaza would interfere with these plans, which trace back to the early days of the occupation and have had steady support from the major political blocs, including figures usually portrayed as doves like former president Shimon Peres, who was one of the architects of settlement deep in the West Bank. As usual, a pretext was needed to move on to the next escalation. Such an occasion arose when three Israeli boys from the settler community in the West Bank were brutally murdered. The Israeli government evidently quickly realized that they were dead, but pretended otherwise, which provided the opportunity to launch a rescue operation  actually a rampage primarily targeting Hamas. The Netanyahu government has claimed from the start that it knew Hamas was responsible, but has made no effort to present evidence. The Israeli police have since been searching for and arresting members of the clan, still claiming, without evidence, that they are Hamas terrorists. On September 2nd, Haaretz reported that, after very intensive interrogations, the Israeli security services concluded the abduction of the teenagers was carried out by an independent cell with no known direct links to Hamas. The 18-day rampage by the Israeli Defense Forces succeeded in undermining the feared unity government. According to Israeli military sources, its soldiers arrested 419 Palestinians, including 335 affiliated with Hamas, and killed six, while searching thousands of locations and confiscating $350,000. Israel also conducted dozens of attacks in Gaza, killing five Hamas members on July 7th. Hamas finally reacted with its first rockets in 18 months, Israeli officials reported, providing Israel with the pretext to launch Operation Protective Edge on July 8th. The 50-day assault proved the most extreme exercise in mowing the lawn  so far. Israel is in a fine position today to reverse its decades-old policy of separating Gaza from the West Bank in violation of its solemn agreements and to observe a major ceasefire agreement for the first time. At least temporarily, the threat of democracy in neighboring Egypt has been diminished, and the brutal Egyptian military dictatorship of General Abdul Fattah al-Sisi is a welcome ally for Israel in maintaining control over Gaza. The Palestinian unity government, as noted earlier, is placing the U.S.-trained forces of the Palestinian Authority in control of Gazas borders, and governance may be shifting into the hands of the PA, which depends on Israel for its survival, as well as for its finances. Israel might feel that its takeover of Palestinian territory in the West Bank has proceeded so far that there is little to fear from some limited form of autonomy for the enclaves that remain to Palestinians. The record of these past years suggests otherwise and the first signs are not auspicious. As Operation Protective Edge ended, Israel announced its largest appropriation of West Bank land in 30 years, almost 1,000 acres. Israel Radio reported that the takeover was in response to the killing of the three Jewish teenagers by Hamas militants. A Palestinian boy was burned to death in retaliation for the murder, but no Israeli land was handed to Palestinians, nor was there any reaction when an Israeli soldier murdered 10-year-old Khalil Anati on a quiet street in a refugee camp near Hebron on August 10th, while the most moral army in the world was smashing Gaza to bits, and then drove away in his jeep as the child bled to death. Anati was one the 23 Palestinians (including three children) killed by Israeli occupation forces in the West Bank during the Gaza onslaught, according to U.N. statistics, along with more than 2,000 wounded, 38% by live fire. None of those killed were endangering soldiers lives, Israeli journalist Gideon Levy reported. To none of this is there any reaction, just as there was no reaction while Israel killed, on average, more than two Palestinian children a week for the past 14 years. Unpeople, after all. The areas being integrated into Israel include a vastly expanded Greater Jerusalem, the area within the illegal Separation Wall, corridors cutting through the regions to the East, and will probably also encompass the Jordan Valley. Gaza will likely remain under its usual harsh siege, separated from the West Bank. And the Syrian Golan Heights  like Jerusalem, annexed in violation of Security Council orders  will quietly become part of Greater Israel. In the meantime, West Bank Palestinians will be contained in unviable cantons, with special accommodation for elites in standard neocolonial style. But certainly I am not prepared to consider them as partners in any respect in a land that has been consecrated in the hands of our nation for thousands of years. For the Jews of this land there cannot be any partner. Dayan also called for Israels permanent rule (memshelet keva) over the occupied territories. When Netanyahu expresses the same stand today, he is not breaking new ground. For a century, the Zionist colonization of Palestine has proceeded primarily on the pragmatic principle of the quiet establishment of facts on the ground, which the world was to ultimately come to accept. It has been a highly successful policy. There is every reason to expect it to persist as long as the United States provides the necessary military, economic, diplomatic, and ideological support. For those concerned with the rights of the brutalized Palestinians, there can be no higher priority than working to change U.S. policies, not an idle dream by any means. Noam Chomsky is Institute Professor emeritus in the Department of Linguistics and Philosophy at Massachusetts Institute of Technology. Among his recent books are Hegemony or Survival, Failed States, Power Systems, Occupy, and Hopes and Prospects. His latest book, Masters of Mankind, will be published this week by Harmarket Books, which is also reissuing 12 of his classic books in new editions over the coming year. His work is regularly posted at TomDispatch.com. His website is www.chomsky.info. Follow TomDispatch on Twitter and join us on Facebook and Tumblr. Check out the newest Dispatch Book, Rebecca Solnits Men Explain Things to Me.